Parpukari started the campaign and we feel it is a sincere attempt to unmask the HinduGod-MuslimPriest's back door maneuvers during Abdullah Ahmad Badawi's regime. The sale of our territory and the oilfields in that sold territory appears as certain as the unidentified financiers of E-Solutions and MalaysianInsider. RPK, why don't you repent and tell us the Inside Story of Kali, Kamaludin, Khairy & his father in-law Abdullah Ahmad Badawi. Is this sale of our territory the last episode of the Midnight Robbery, or are we to expect more ? ANOTHER BRICK hits hard HERE. Royal Commission of Inquiry please. SAYA SOKONG 200 PERATUS DESAK KERAJAAN NAJIB MESTI TUBUH SURUHANJAYA DIRAJA SIASAT ISU HANGAT YANG TIDAK NAMPAK MENGUNTUNGKAN NEGARA INI. Rakyat marhaen yg mengundi BN selama 40 tahun. Re your and rocky bru's previous posts. Any news on Sheryll Stothard? The day has passed and the silence is deafening! 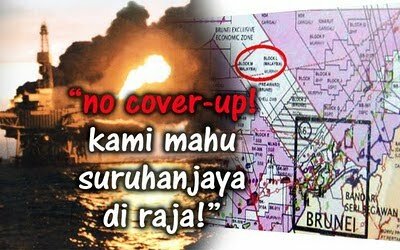 Is Petronas putting up another round of smokescreen? CRUMBLING KEDAH and a new MB!